In Sanders, Arizona, residents drank uranium-contaminated water for years. The researchers’ next image — a chart with a flat red line cutting through yellow bars — was even more worrisome. Tommy Rock, a Ph.D. candidate studying water contamination at Northern Arizona University, explained that the red line was the Environmental Protection Agency’s threshold for uranium allowed in public water systems: 30 micrograms per liter. 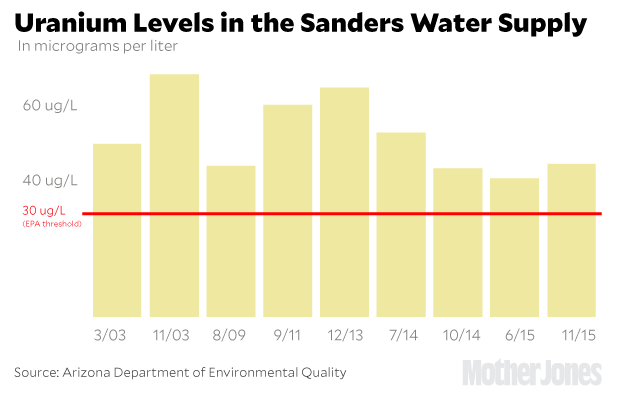 The yellow bars represented uranium levels in Sanders’ water supply dating back to 2003. They hovered around 50 micrograms per liter. The meeting happened two months before researchers in Flint, Michigan, revealed that their city’s water was laced with lead. In both cases, curious scientists exposed years of drinking-water violations that affected predominantly poor, minority communities. 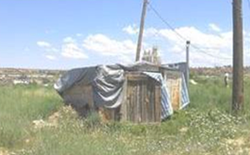 (Most Sanders residents are Navajo and live on less than $20,000 per year.) But unlike urban Flint, Sanders is home to just 630 people and consists of a cluster of single-family homes, a gas station, a dollar store, two churches and a trading post — all surrounded by miles of red rock and sage brush. The town is one of thousands of rural communities across the country where water quality has quietly evaded federal health standards for years. Many small utilities simply cannot afford advanced water-treatment technology, says Jeff Griffiths, a public health professor at Tufts University and a former adviser to the EPA on drinking water. (An inspection of the Sanders well in 2012, for example, found that “the owner pours an unapproved bleach product down the casing vent daily as the method of disinfection.”) According to EPA data, roughly 6 million Americans use one of 2,300 public water systems that qualify as “serious violators” — defined as having multiple, continuous or serious health or reporting problems. Ninety-nine percent of those utilities serve fewer than 50,000 people. Together, they serve a population 25 times the size of Flint. The hubbub led Sanders school system superintendent Dan Hute to test the schools’ water supply, which comes from a private well unaffiliated with Sanders’ water system; the water in Sanders elementary and middle schools was also contaminated. Hute tapped into school budgets to provide bottled water to roughly 500 students and 150 teachers.”I’ve gotten no help from anybody,” Hute told me earlier this spring. According to Rock, no local, state or federal agency provided the town with bottled water or filters. These people have been drinking this for years. It’s not a short-term exposure. I’m a little baffled by their lack of concern. Under the Safe Drinking Water Act, utilities are required to notify their customers if water has contaminant levels above the EPA’s threshold. If they fail to do so, the law calls for the “primacy agency” — in Sanders’ case, the state — to intervene. After 30 days, the EPA steps in. State records show that over the past two decades, environmental regulators repeatedly approached the local utility’s owners, an elderly couple named Pat and Lillie Paulsell, about the poor water quality. (Pat maintained the well until his death in 2014, when Lillie took over the utility, Arizona Windsong Water Company. Lillie Paulsell declined to be interviewed for this article.) An inspection in 1995 found that Windsong wasn’t testing for bacterial or lead contamination. By 2002, the utility had risen to the top of the EPA’s “Significant Noncompliance” list due to a host of reporting and health problems. Yet, according to an ADEQ representative’s notes from that year, Pat Paulsell “continued to make no effort to comply other than to send me a package of analytical results, which I have not yet received.” In 2012, a state-commissioned water quality report noted live wiring on the floor of the well. Uranium contamination continued to be a “major problem.” In 2014, the utility paid a $1,000 penalty to the EPA for its violations — but the uranium levels continued to exceed federal standards. “There are Sanders equivalents all over the country,” says Macler, the EPA toxicologist. “Small little communities that have limited ownership, no money, no resources.” Many, adds Griffiths, the former EPA drinking water adviser, are unwilling to cooperate with state and federal regulators, which don’t have the financial capacity to force the matter. “We have a foolish system for how we deal with this stuff,” he says. In early April, eight months after the state distributed a water advisory and more than a decade after the first reported uranium, Sanders residents got some good news: Arizona and the Navajo Nation agreed to let Sanders switch water sources to the nearby Navajo utility. Within the month, water from a new source was flowing through the old pipes, which will be replaced this summer. “It’s a really big sigh of relief,” says Tonya Baloo, who’s now watering the trees in the yard and letting her kids bathe at home every once in a while. Her family still drinks from jugs of water she buys from Walmart. Maybe after the pipes are fixed, she says, they’ll once again start drinking from the taps.